Module 1 introduces the Microsoft Excel 2016 basics. Module 2 covers advanced Microsoft Excel 2016 features. Introduces entering labels, values and formulas, formatting cells and worksheets, copying cell data, using Flash Fill, creating different types of charts such as Pie, Column, Line, Bar and Sparkline charts, applying Quick Analysis and using the drawing tools. Covers IF statements, Lookup commands, creating Sales Invoices, creating Payroll/Payslip systems, using Macros and Buttons, financial and date calculations, creating Pivot Tables and Pivot Charts, using table filters and timelines, applying Conditional Formatting, and using AutoFormat, Styles and Save options. using the format cells dialogue box. importing graphics and clip art. The multi-user version provides a project for students to apply their spreadsheet skills:. It involves creating a payroll for the EasyTune Car Care company. linking an Office file to 3 Department file. The multi-user version provides a project for students to apply their spreadsheet skills. 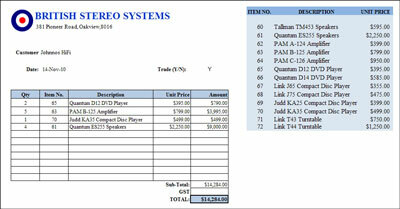 Students are required to create an invoice/stock list system for Quantum Electronics (a stereo systems manufacturer).